This week I came upon a video on Facebook by Bicycle Dutch called “U.S. Cycling from a Dutch Perspective.” The video may have already made the rounds, but I’m posting it here because the (lack of) infrastructure and driver behavior in the U.S. and Chicago in particular have been on my mind lately, with several people I know being hit by drivers in the past year (including, of course, myself). As the video says, “This situation makes clear why you are 30 times more likely to get injured as a cyclist in the U.S. than in the Netherlands.” This is a outrage and needs to change. On LGRAB’s Facebook page, I shared a photo of the recently-completed separated bike lane on Milwaukee Avenue, Chicago’s busiest bikeway. I’ll write more about this new infrastructure after I bike it myself next week. In response, Facebook Friend Matt shared an article about the separated bike infrastructure in Indianapolis, Indiana, via an article from Treehugger, The biggest bicycling infrastructure achievement in North America that you’ve never heard about. Trisha biked around Indy four years ago and was impressed with the trails and bike lanes, so I knew that the city has some bike infrastructure, but I had no idea it was so sophisticated and extensive. After watching the video below by Streetsfilm and reading more about the infrastructure in their article, The Next-Gen in U.S. Protected Bike Lanes, I am in awe of what the city has accomplished. Other mid-size cities should try to replicate this type of project, which must be great for quality of life, health and tourism. I know that Indy is now on my list of places to visit. I’m curious: do any of you live in Indy? If so, are these protected paths useful for biking to work and errands – that is, actually getting around the city? Although not directly bike-related, I am compelled to share with you this beautiful short film. Created by Julia Warr, the film features Maia Helles, a 95 year old Russian ballet dancer, as she shares her secret for a long and happy life: simplicity. The running time is only four minutes – please do watch it now; I’ll wait. Beautiful. I want to remember Maia and try to make little changes in life to foster the kind of happiness she displays. If I could be assured of having half of her health and serenity in my later years (maybe even toodling around on my bike still), I would not fear growing older as much. I ended the year on Saturday with a ride downtown along the Lakefront Trail with my friend Elizabeth. Here’s a little video of cycling the Lakefront Trail heading south. I’m riding my Betty Foy and Elizabeth occasionally pops up with a santa hat on her helmet. The video is sped up by 150% and the song is by The Moonlighters from Free Music Archive. You can see that the car-free trail is a very nice route, especially when it’s not crowded. I would take this route to work every day if it were a little more conveniently located for me. Earlier this week, I posted a video of my commute along quiet side streets. To show how different the ride is along a busy route, on Friday morning I took Lincoln Avenue, a popular street for both bikes and motor vehicles. I considered this taking one for the team, because I hate this route during rush hour. Lincoln Avenue is a major bikeway, with either bike lanes or sharrows along the length of it. As I discussed previously, it’s a pathetic set-up for such a popular bike route. Nevertheless, most bicyclists would take this street from my neighborhood to downtown. This route takes about 25 minutes to my work, while the side streets route takes about 40 minutes. Lincoln is faster because it is diagonal, a straight shot to downtown. The bicyclist who happens to be in front of me for most of the video is carrying a child on the back, very cool. I position myself a little further in the street and away from the parked cars than she, to avoid the door zone. There’s a lot of traffic during rush hour and I generally filter on the right to get in front at stop lights. This is the safest place to wait, but it’s important to position yourself in front of cars and trucks, not next to them. Also, I know the light cycles well and go ahead only when I have enough time to do so safely. The video is sped up by 250% and shows only 1/3 of the ride. My memory card got full right before I passed three solid blocks of traffic-jammed cars. That’s always smugly fun. The song is Beat Culture by Midori and I found it on Free Music Archive (thanks to Vee for the tip!). Can you see why I prefer the side streets? Which route would you take? Here is a little video I made of my morning bike commute through relatively quiet side streets. Not the most interesting video ever, but I wanted to show how it’s possible to commute into downtown Chicago while avoiding busy streets and scary traffic. This is part of the quiet route that I often take, which I blogged about a few months ago here. It’s hard to hear what I’m saying in the beginning and my memory card became full about 1/4 of my way to work, but you get the idea. The speed is 2.5x faster than reality. Major shout-out to super sweet reader Ambrose, who gifted me her old bike camera mount after I posted my last ridiculously shaky handheld video. It made a huge difference. Thank you!! 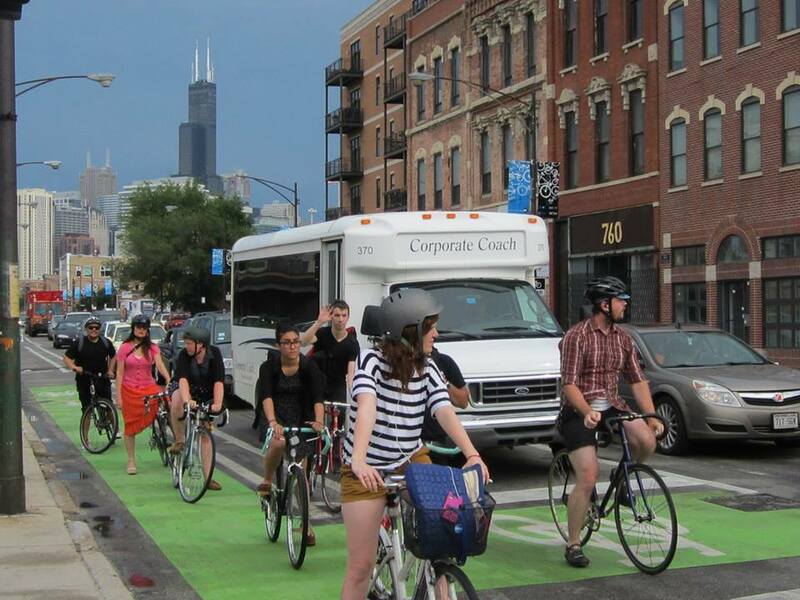 A couple of weeks ago, I shared photos of my bike ride through Chicago’s first protected lane on Kinzie Avenue. I love this lane, so now I’m sharing the experience with all of you. Sorry for the jumpy video – the ride is more peaceful than it looks, but Chicago’s streets are bumpy and I was holding the camera in my hand. We have the winners from Part II of the LGRAB Summer Games! Watch the video for a dramatic reading of the names or go beyond the fold to bypass the suspense. And with the return of sun, and above-freezing temperatures in Nashville (at least for the past two days), I am ready to indulge. The wind in my hair was exactly what I needed. End of the ride on Wednesday -- for some reason I choose cold days to take photos! Charlotte Gainsbourg’s latest album, IRM. Beck co-wrote and produced it and it is delightful. Watch the video of the album’s first single here. Delicious Thai food from The Smiling Elephant. Scarf month on Academichic–so many fun ideas! My fave so far, which worked great with my hair. The continuing antics of Baby Walter, when he’s not driving me crazy. Here’s a video of his latest favorite activity, although he was somewhat distracted by the camera. Now, off to work I go. Happy Friday! *and yes, I meant to say “blahs” and not blues. Teen Witch! I was obsessed with that movie for a bit in 1990, carrying around a pink-papered, heart-shaped notebook in which I wrote all the spells. Somehow I had forgotten all about it, until I saw on Lily and the Muse that Teen Vogue posted a remake of the iconic Top That “rap” scene. The two girls happen to be riding bicycles in awesome preppy 80’s outfits. You can watch the remake here. The remake is by designer Rachel Antonoff (they’re wearing her new designs) with Alia Shawkat from Arrested Development. This demonstrates the growing popularity of both bikes and 80’s fashion. I’ve been out of town for a few days, but I’m looking forward to getting back and spending more time with the Flik. It’s a pretty sweet ride so far, and a real conversation starter. Before I left, I recorded this brief, bare-bones video of the folding process over my lunch break — couldn’t pass up the opportunity to spend some time outdoors in “Dragon Park” on such a beautiful fall day! Apologies for the lack of close-ups — a full review is coming soon. p.s. if you haven’t found it yet, check out our YouTube channel. From the whimsical to the informative, we’re adding all sorts of things to it these days. Anyway, this is for all those interested in the Rivendell Betty Foy. It’s a very new bike and there’s not much information out there, but there is another video from Velo Fellow of his wife buying her Betty, so any interested parties should check that out, too. Many people come to our site in search of information about Dutch bikes. It’s pretty shocking that there’s not more out there–even on YouTube, it took a while to turn up videos featuring Batavus bikes. Here are a few of my favorites. The first is charmingly retro, with a man in a straw hat puttering around on his Old Dutch (step-through!). It presents life as a series of choices and I guess he chooses the bike…but mostly I like seeing the bicycle infrastructure, including designated lights and paths, and the posse of bikes outside the grocery store, locked with O-locks only! Also, the music will stick in your head (sorry). The second is your more typical gimmicky commercial, and features a sportier bicycle model…possibly a Personal Bike? The quality is too poor to tell.